For most people, a Porsche 911 fettled by Singer Vehicle Design is already a pretty special piece of kit. 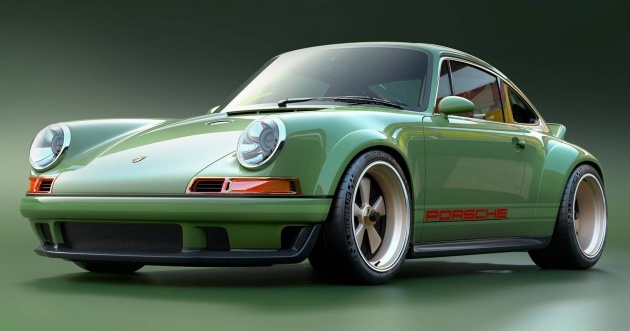 But Porsche enthusiast and long-time client Scott Blattner is not most people – he had specific ideas on how to turn his 1990 Porsche 964 into one that is lighter and faster. As such, the Californian concern got together with Williams Advanced Engineering – under the same company as the championship-winning Formula One constructor – on a “Dynamics and Lightweighting Study.” We’ve already shown you the engine, developed with the assistance of legendary Porsche engineer Hans Mezger, but here’s the rest of the car – which, you’ll probably agree, is absolutely stunning. Williams optimised the underbody and surface aerodynamic performance through computational flow dynamics (CFD), with another Porsche icon Robert Singer roped in as a consultant. The bodywork is made completely out of carbon fibre to achieve a minimum weight of just 990 kg, and the front splitter and the slotted roof design have both been shaped using CFD. At the front, larger intakes feed the oil cooler, while the fenders – already fairly broad on “regular” Singers – have been stretched still further to accommodate the extra track width. Those fenders hide centre-lock 18-inch forged magnesium monobloc wheels by BBS Motorsport, shod with bespoke Michelin Pilot Sport Cup 2 tyres, and there are also Brembo carbon composite brakes with monobloc callipers. Elsewhere, the suspension components are lighter and feature enhanced geometry and improved adjustability, paired with custom EXE-TC dampers. Those holes in the rear side windows are part of a ram-air intake to force air into the massively uprated engine. That engine is a quad-cam, naturally-aspirated air-cooled flat-six that has been bored out to 4.0 litres in capacity, boosting output to a heady 500 hp. There are dual-oil circuits, new cylinders and pistons with titanium con-rods, aluminium throttle bodies with carbon-fibre trumpets, new upper and lower injectors, a carbon fibre air box, an Inconel and titanium exhaust system and an enlarged engine cooling fan. Paired to the mill – which revs all the way to 9,000 rpm – is a Hewland magnesium six-speed manual transmission with a gorgeous exposed linkage. 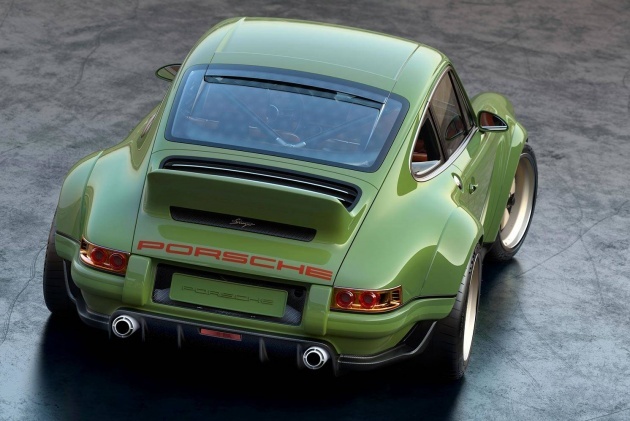 To hone the car, Singer has enlisted the help of race car driver Marino Franchitti and Top Gear host Chris Harris, who worked in close collaboration with Williams’ dedicated vehicle development team. Production will be limited to just 75 units at Williams’ campus in Grove, Oxfordshire, with Singer working closely with the owner to tailor the car to suit – whether it be stripped bare for the track, kitted up for intercontinental touring duty or anywhere in between. Pricing is dependent on the client’s wishes, and with “standard” examples already fetching a pretty penny, rest assured it won’t be cheap. The car you see here, in Absinthe with Blood Orange highlights, is Blatter’s, and two other collectors Jan Koum and Mark Evenstad also supported the project and expressed interest. What do you think of Singer’s creation? Sound off in the comments section after the jump. just shut up & take my money! Secondly, since there is only 75 units, the down payment is only RM1 million. Please pay your deposit at the counter. TQVM for being a Porsche customers. this car is built by singer, not porsche. and i wonder how the heck singer manage to find 75 old 964s lying around, did they slowly buy them from the used car market ? Goddamn! I want one of this! Is it still a Porsche. The best interpretation of modern classic. This thing is sooo goood that people will worship it.